WASHINGTON: Donald Trump’s feud with black athletes in the NBA and NFL has drawn attention to the racial fault lines which divide sport in the United States, analysts say. Trump triggered a firestorm of controversy last week after taking aim at American football players who knelt during the national anthem to draw attention to racial injustice. He later revoked a White House invitation to the NBA champion Golden State Warriors. 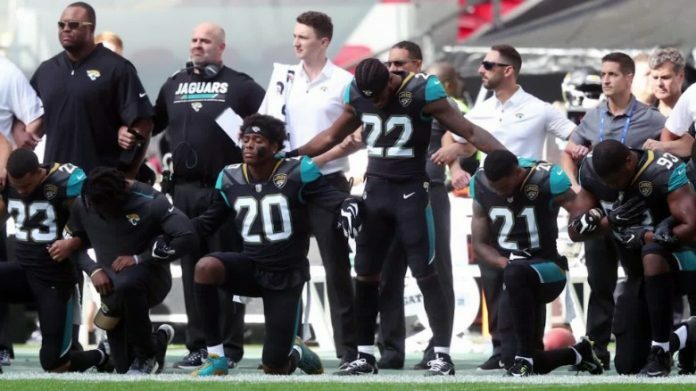 The US president’s tirade against NFL protesters culminated in an unprecedented show of defiance on Sunday when a large number of mostly black players dropped to one knee during the national anthem. Other players stood with arms interlocked while “The Star-Spangled Banner” was played in stadiums across the league. The playing of the national anthem is customary before sporting events in the United States. Trump has sought to reframe the meaning of the anthem protests as an unpatriotic gesture which shows disrespect towards the United States and its flag. In the NFL, around 70 percent of players are black, compared with 75 percent in the NBA. By contrast, there are only around 30 black players in ice hockey’s National Hockey League, which is followed mostly by a white audience on television. A 2013 survey by Nielsen found that 92 percent of NHL viewers were white, with only three percent black. On Sunday, a day after announcing that the Golden State Warriors would not be welcome at the White House after star player Stephen Curry expressed misgivings about attending, Trump warmly praised the NHL’s Stanley Cup winners the Pittsburgh Penguins. “Please to inform that the Champion Pittsburgh Penguins of the NHL will be joining me at the White House for Ceremony. Great team!” Trump tweeted. While the US leader’s main focus has remained with the NFL, with a lengthy barrage of tweets taking aim at players who protest, he also found time to praise NASCAR, the most popular form of motorsport in the United States. White viewers make up 94 percent of the television audience for NASCAR, according to Nielsen’s 2013 study, against only two percent black viewers. The sport, which is most popular in the conservative South, has often seen Confederate flags — considered by some as a racist symbol — at its motor-racing stadia in recent years. According to Colorado academic Coakley, Trump’s juxtaposition of praising ice hockey and NASCAR while simultaneously antagonising the NFL and NBA is no coincidence. “He definitely did it on purpose — he knew he would get support from his base,” Coakley told AFP. “I don’t expect hockey players or golfers or NASCAR drivers to lock arms. “His comments are tied with the racial issue: he says that players that take a knee are not real Americans — but players that take a knee are mainly black,” he added.